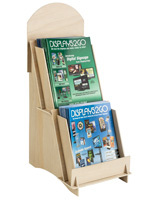 Looking for high end designer brochure holders or modern magazine displays that offer a little more style than traditional designs? 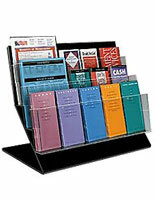 These wood and acrylic literature holders provide an elegant accent for any upscale business. 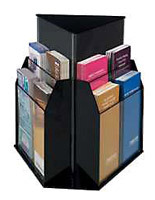 The designer brochure holders, sometimes called modern magazine displays, are perfect for distributing company catalogs, booklets, pamphlets, and other printed materials. 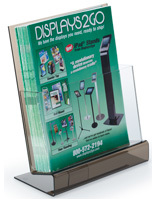 The easy access design of each model makes it so customers, guests, and visitors can quickly locate the publications they require. 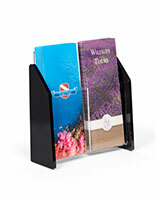 The designer brochure holders are optimal for doctors' offices, hotel lobbies, contemporary retail stores, and many other classy locations. 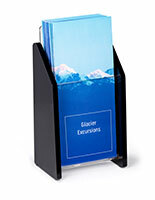 The wood and acrylic display pockets in this category supply the perfect solution for organizing and distributing product spec sheets and manufacturer information as well. 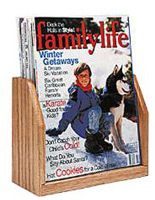 Check out the various selections to find the magazine or flyer display that is right for your business or organization. 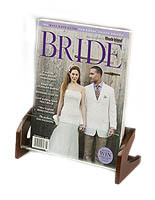 How are these modern magazine displays different from other options in the online catalog? 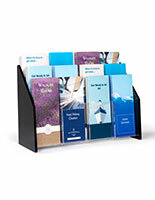 These designer brochure holders utilize higher quality materials than most of the alternative choices. 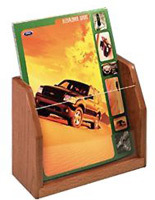 The high end wooden designs are manufactured using solid hardwood that is intended to last a very long time, while supplying a stylish touch to the display location. The acrylic pockets feature decorative end caps that add contemporary flair to modern businesses. There are also unique smoked acrylic units that put a fun twist on the traditional look of clear plastic or acrylic. 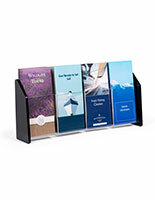 Many times, these designer brochure displays can be coupled with like designs to create thematic presentations. Why not purchase a whole set to upgrade the interior design of your office? 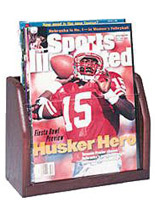 The modern magazine displays may feature slightly higher price tags than some of the corrugated cardboard and foldable literature holders but are worth every cent. 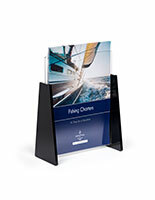 The long-lasting construction and unsurpassed style make the displays functional for all kinds of offices. 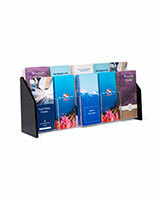 Luxury interiors are ideal places to set up these contemporary pamphlet pockets and magazine rack displays. 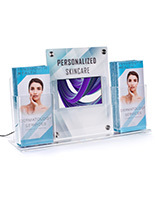 The compact assembly of each unit fits neatly on top of counters, which is great for crowded checkout stands, trade show booth exhibit tables, and service desks. Rather than scattering a pile of literature across the table, users can reduce clutter and increase the functionality of their workspace. Customer service agents are especially excited about these high end designs because they allow them to better serve clients and patrons. In many cases, customers are able to grab the information and publications themselves, which takes out the middle man. 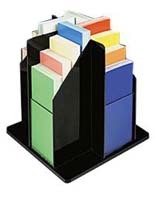 Imagine the time saved as well as the increased efficiency that is possible with these countertop literature holders. 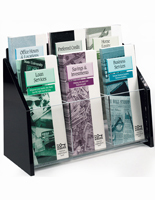 Spend more time getting things done and less time organizing pamphlets, catalogs, and magazines when you buy these affordable yet high-class brochure racks. There are less obvious establishments that can also benefit from these modern displays. Museums, particular visual arts locations, are great places to utilize the upscale holders. 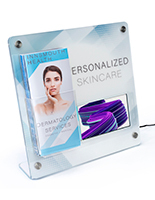 Today's technological schools are always competing for students and these sophisticated literature displays are an ideal way to show that your institution is not behind the times. Think about the impact these unique publication organizers will have on visitors, incoming students, and even faculty. Make it know that your institution, no matter what sector, is on its game by implementing some of these outstanding literature distribution systems.